MD Helicopters MD 600N. Photo. Characteristics. Home » Blog » other » MD Helicopters MD 600N. Photo. Characteristics. 22.11.1994 made the first flight of an experienced helicopter MD 630N. 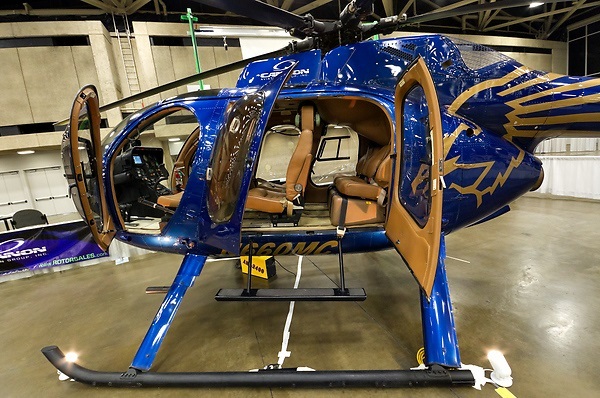 It differs from the MD 520N helicopter by its long cabin length on 0.76 and on the tail boom on 0.71. It has a six-blade main rotor of the same diameter, as on MD 520N and GTE, 485kW power, limited transmission to 447kW. 28.03.1995 made the first flight of a multi-purpose serial helicopter MD 600N, which is based on the MD 630N. Compared to MD 520N, the size of the cabin is increased due to the additional section on each side with two doors, which makes it possible to increase the length of the floor of the cabin to 1.8m, and the length of the doorway to 1.6м, providing transportation of large loads to 1250kg in the cabin. The largest mass of cargo that is carried on the external sling increased to 1360 kg.